If you are looking to be able to pick up a quality skimboard for wave riding, sand skimming, or flatland, you have come to the right article. These boards are a ton of fun to use regardless of your age or experience. If you want to have as much fun as possible, you are going to want to look for a product that is capable of skimming across the water with ease and for a long distance. Picking up a random skimboard may not allow you to do this, which is why we have created a buying guide going over the various things that you should look for in a skimboard. We also have come up with an analysis of our picks for the top skimboards on the market so that you can see some of the awesome options that are available to you. How long of a skimboard should I purchase? The size of board you buy should depend partially on how large of a person you are. The best way to get a relatively good idea as to what size of board you should buy is to look at a skimboard sizing chart. Generally, you will have to know your height and weight and then a recommendation for your skimboard will follow. It is important to note that it may not be the best idea to follow these charts exactly, however, as different people have different wants and needs as far as skimboarding goes. The smaller the board you buy, the easier it is going to be to be able to maneuver your board around and hop it around as you please, but you will lose speed. The larger the board you buy, your skimboard will be faster, but you won’t have as much maneuverability. What should I look for in terms of what the skim board is made of? Foam: This is the lightest and cheapest type of skimboard that you can buy on the market. Sometimes you will find boards that are fully made out of foam and others will have a foam core in them, which helps to make the board lightweight in design and capable of floating. The more foam that is in the design, the better the skimboard will be at floating on top of waves. Weight limits are always important to keep in mind when looking at boards with foam in them as this is the least durable material found in skim boards. Wood: If you are looking for a moderately priced skimboard, you may come across some wooden boards in your search. These types of boards have moderate price tags and are relatively good at sitting on top of the water. They will generally be fairly light weight in design and you will be able to move relatively fast on the water with this type of board. Generally, this material is used in shallow waters and the boards themselves are quite thin, which helps with portability and maneuverability. Carbon Fiber: This is the lightest and most expensive material that you will find in a skimboard design. This material will allow you to be able to float on the surface with ease and you will be able to move faster on this board than with any other type of board on the market. This design is what most professional skimboard user’s use and it will definitely cost you. How do I decide what tail I want in a skimboard design? 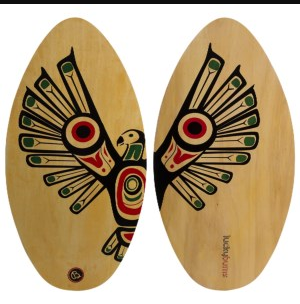 Generally speaking, you will have to pick from two different types of tail designs when you are choosing a skimboard. The tails do actually play a large role in how your board handles so this is definitely an area of the board that you will want to take a look at. The pin shaped tail is a common design for beginner and inexperienced boards as this allows you to be more stable in the water. A square or a W design in a tail is the best type of board for maneuverability, but you do lose stability in these types of boards. It can be harder for an inexperienced or beginner skimboard user to use a square or a W type of tail, which is something that you might want to keep in mind. Should I look for something that is coated with a resin? If you want your board to have a good amount of grip and to last you for a long time, you are definitely going to want to try to find something that is coated with a resin. Resin helps to make your board more durable and depending on, what is used, a resin may also help to add some grip to your board in order to make you more stable in the water and allow you to maintain your balance a bit better. This is definitely something you might want to keep your eyes peeled for when you are looking at various skimboard designs. Is a rocker shaped board something I should look for? In case you didn’t know already, a rocker is essentially how much curve the head of the board has. The more curve that a unit has the easier it is to get the board going in the water. For a beginner, you have less of a chance of face planting if you get a board that has a decent amount of rocker on it. The only problem that you are going to find on a board that has too much curve is that your board does tend to get a little bit slowed down, which is why professional riders don’t have much rocker in their designs. How long of a warranty can I expect from a skimboard? One common thing you are going to notice about skimboards is that the more you pay for the unit, the longer the warranty you are going to find. This is largely due to the fact that the more expensive boards are made up of more durable materials that are capable of lasting for longer periods of time before breaking down. Something like a foam board is not going to have a really long warranty on it as foam tends to wear out over time compared to something like a carbon fiber design. If you are having a hard time locating what materials your board is made out of, you may want to take a look at the warranty as this can help to give you a good idea as to whether the board is made from quality materials or not. If you are looking to pick up a high-quality carbon fiber design, you should make sure that you take a good look at this skimboard. The unit comes in three different color options and you can choose from three different sizes at the checkout to suit your weight and size needs. The board is designed to excel at maneuverability and this is a great board to perform tricks on if you are an experienced rider. The design is made in the U.S.A. If you have a high budget and a bit of skimboarding experience, this board could be the perfect one for you. The unit is capable of coming in almost any size that you could possibly need and is designed to be as durable as possible. It is hard to find a unit that is this light weight in the marketplace for this kind of a price tag and that uses such little resin and so much reinforcement in its design. Definitely, a board that you may want to think about purchasing if you are interested in learning to do some tricks. If you are an adult that weighs between 140 and 170 lbs, you may just be interested in picking up one of these designs. The unit comes in three different color options at the checkout and is more than capable of being used on waves and in shallow water. The unit is perfect for people who have an average body type and not a whole lot of experience as this unit has some pretty good stability and decent maneuverability. So long as the size of this board suits your needs, you are going to be pleased with this design. The unit comes in a variety of color options to suit your tastes and you are going to love just how durable this board is over time. Although this skimboard may have a bit of a high price tag, you are going to be quite pleased with its ability to be able to do tricks and move around in the water. This definitely isn’t the fastest board out there as a result of the rocker design, but this is an ideal board to learn on and become a better skimboarder. If you have a low budget and think that a wooden skimboard would be sufficient to suit your needs, you may like the looks of this design. The unit comes in five different style options at the checkout and is designed specifically for beginner skimboard users. The unit is quite stable in the water and has a good amount of maneuverability so that you can get a good feeling for the board without falling into the water over and over again. So long as you are happy with getting a wooden skimboard, you are likely going to enjoy what this board has to offer. The unit is an ideal learner’s board that is quite forgiving and more than capable of working in shallow water where you can get comfortable with learning to skimboard properly. The board may not cost a lot of money and may not be made out of carbon fiber, but this board is a lot of fun to use. If you haven’t tried skimboarding before, you may definitely want to consider picking up this design. If you are a beginner skimboarder, have a bit of a higher budget and want a carbon fiber design, you should look at this awesome skimboard. The unit may only come in a blue color option at the checkout, but the board is an awesome kid’s board that is definitely a durable construction. The unit is designed specifically for beginner riders meaning that the board is extremely stable in the water and easy to learn to use. So long as you are happy with the blue design of the board and are within the 110 lb weight limit of the unit, you are going to like this design. The unit is an awesome beginner board that may command a higher budget than a wooden board, but that brings durability and reliability to the table. This is truly a great fiberglass board that a kid can enjoy and one that can hold up to a lot of wear and tear. Definitely, a beginner board that is worth looking into if you are a younger kid interested in the sport. If you have a really low budget for a skimboard and just want to be able to try a board out, you may be interested in this plywood and foam design. This product comes in four different color options at the checkout and you can also choose to pick up this product in three different size options. The unit is capable of holding riders anywhere from 100-150 lbs plus depending on the size that you purchase. A very nice unit if you want to save some money. If you are just looking for a board to allow you to try out some skimboarding, you may definitely want to consider picking up one of these types of boards. The unit comes in quite a few different color options to suit your personal tastes. This is a design that is great for beginner skimboarders as it allows the user to get some really good grip and a lot of feedback from the board, which is ideal when you are first learning. Overall an awesome board for the lower budget price that it is and one that you may want to consider buying to learn on, even though the unit might not last you forever. We hope this article has helped to teach you some things about skimboards and that you now feel as though you will be able to pick up one that is of a good quality. With so many on the market, it can be hard to know what a good quality board is unless you look at the finer details of the board to make sure. It never hurts to setup some kind of a budget for yourself before purchasing one of these units as they do tend to get fairly expensive depending on the brand and the quality of the board. We wish you the best of luck in picking up a new skimboard and we hope that you manage to pick out a super fun, fast board.